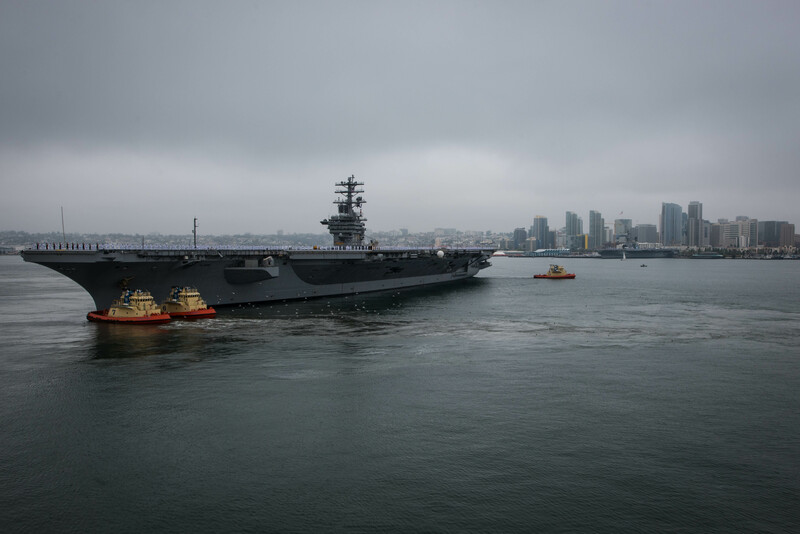 SAN DIEGO – Ships and units from the Nimitz Carrier Strike Group (CSG) departed San Diego for a regularly scheduled deployment, June 5. This is a previously planned, routine deployment and not in response to any specific incident or regional event. This deployment is an example of the U.S. Navy’s routine presence in waters around the globe displaying our commitment to stability, regional cooperation and economic prosperity for all nations. The aircraft carrier USS Nimitz (CVN 68), Arleigh Burke-class guided-missile destroyers USS Kidd (DDG 100), and USS Shoup (DDG 86) departed their homeports of Naval Base Kitsap, Washington, and Naval Station Everett, Washington, respectively, June 1, followed by a brief stop at Naval Air Station North Island where they met up with other ships and units of the carrier strike group. Additional Nimitz CSG ships include the San Diego-based Arleigh Burke-class guided-missile destroyers USS Howard (DDG 83) and USS Pinckney (DDG 91), and the San Diego-based Ticonderoga-class guided-missile cruiser USS Princeton (CG 59). Nimitz also embarked the aviation squadrons of Carrier Air Wing 11, the Lemoore, California-based “Argonauts” of Strike Fighter Squadron (VFA) 147, “Black Knights” of VFA 154, “Blue Diamonds” of VFA 146, the San Diego-based “Death Rattlers” of Marine Fighter Attack Squadron (VMFA) 323, the Whidbey Island, Washington-based “Gray Wolves” of Electronic Attack Squadron (VAQ) 142, the Norfolk, Virginia-based “Blue Tails” of Carrier Airborne Early Warning Squadron (VAW) 121, and the San Diego-based “Eightballers” of Helicopter Sea Combat Squadron (HSC) 8, “Wolfpack” of Helicopter Maritime Strike Squadron (HSM) 75 and “Providers” of Fleet Logistics Support Squadron (VRC) 30. The strike group deployed with approximately 7,500 Sailors and is focused on maritime security operations and theater security cooperation efforts. The Nimitz Strike Group is part of U.S. 3rd Fleet, which leads naval forces in the Pacific and provides the realistic, relevant training necessary for an effective global Navy. U.S. 3rd Fleet constantly coordinates with U.S. 7th Fleet to plan and execute missions based on their complementary strengths to promote ongoing peace, security, and stability throughout the entire Pacific theater of operations.